With joint interests in sustainability of the built environment, Syracuse University and Nanjing University (NJU) of the People’s Republic of China signed a cooperative agreement on Wednesday, Oct. 21, to establish the International Center for Green Buildings and the Urban Environment. The objective of the new partnership is to promote cooperation in environmental and energy research and education. 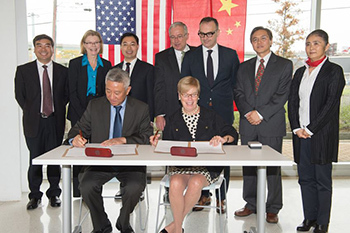 Representatives from Nanjing and Syracuse University signed the agreement during a ceremony held at the Center of Excellence. The agreement to establish the new center was signed by officials from the two universities at an event held at the Syracuse Center of Excellence in Environmental and Energy Systems (SyracuseCoE). The ceremony began with Jensen Zhang, professor of mechanical and aerospace engineering and director of Syracuse University’s Building Energy and Environmental Systems Laboratory, welcoming the guests to Syracuse University. Representing Syracuse University and signing the document were Elizabeth D. Liddy, interim vice chancellor and provost; Michael A. Speaks, dean of the School of Architecture; and Edward Bogucz, executive director of SyracuseCoE. NJU was represented by Yi Pan, vice president for research, and Wowo Ding, dean of the School of Architecture and Urban Planning. The mission of the center is to advance interdisciplinary research and education through international collaboration and achieve broader impact of the two universities in the field of sustainability related to energy, environment and health in buildings and urban communities. It will be accomplished through specific objectives, including collaborative research projects, educational programs, joint outreach programs between academics and international industrial partners, and multidisciplinary faculty and student exchange. The partnership has already involved faculty and students from three different Syracuse University colleges and schools, including Architecture, Engineering and Computer Science and the Maxwell School of Citizenship and Public Affairs, through interdisciplinary coursework, lectures and extension programs. “We look forward to supporting this new center, and we should let the world know that Nanjing University’s office will be here on the second floor in the SyracuseCoE headquarters. To our new partners from Nanjing, I say ‘Welcome home,’ we look forward to working with you,” said Bogucz. Both universities are internationally known for their contributions to the field of sustainability. The newly established center demonstrates their strong commitment to facilitate world-class international academic collaborations by working together to develop innovative new solutions for global challenges.